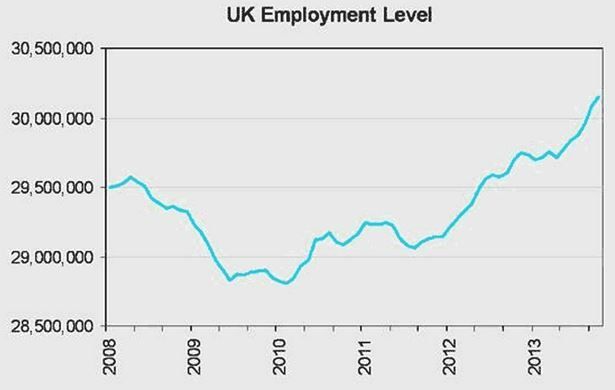 The UK unemployment rate dropped to 7.1% for the September to November 2013 period, a 0.5 percentage point drop compared to the June to August 2013 period, the fastest jobless fall for 17 years, according to the Office of National Statistics (ONS). From the September to November period there were 2.32 million people unemployed, 167,000 fewer than from June to August. There were 24,000 fewer people (1.25 million) claiming Jobseeker’s Allowance in December 2013 compared to the month before. The Bank of England had said it would consider raising interest rates when unemployment dropped to 7%. Does this larger-than-expected fall in the country’s unemployment rate raise the possibility of an earlier interest rate hike? Yes, but the central bank will hold out for as long as it can. After Mark Carney became governor of the Bank of England, the UK’s central bank adopted a forward guidance in August 2013 from the Monetary Policy Committee which had set a 7% unemployment rate as the threshold to start raising interest rates. Currently the central bank’s benchmark rate is set at a 300-year low of 0.5%. When the guidance was adopted, the Bank of England had expected the unemployment rate to remain above 7% until mid-2016. The latest steep fall in unemployment clearly shows this is going to happen much earlier, probably this year. The Monetary Policy Committee now says that even when unemployment hits the threshold there should be no hurry to raise rates. The UK’s unemployment rate is still well above pre-crisis rates. The drop in unemployment is coming from both short- and long-term unemployed people, according to ONS figures. 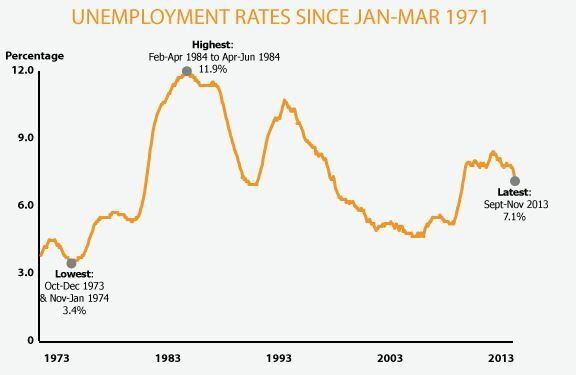 Especially encouraging is the fall in the number of 18 to 24 year-olds out of work (youth unemployment). Young people in work rose by 77,000 during the last quarter of 2013. Youth unemployment dropped by 39,000, while the number of young people claiming Jobseeker’s Allowance saw its 19 successive month of decline. During Q4 2013 there were nearly 570,000 job vacancies, 75,000 more than in Q4 2012. The Pound Sterling rose on the news, to 1.2222 euros (a 1-year high) and $1.6553 (a 3-week high). The Department of Work & Pensions says there are now a record-breaking 30.15 million people in work in the UK, 1.3 million more than in 2010. The number of people in work increased by 280,000 during the last quarter of 2013, the biggest quarterly rise since records began, the UK government says. There are currently more people in work in the UK than ever before. Average earnings increased by 0.9% during the three month-period to November 2013 compared to the same period in 2012. With inflation at 2%, wages continue to be squeezed.